What tool do I use for interacting with Twitter? Because, I am a frequent user of Twitter, many people ask me what is my favourite tool to use. I like to be helpful, but the reality is that I do not have a single favourite tool and I use many different tools depending upon the circumstances. Luckily Twitter keeps a record of the tool that is used to publish each status update, so I decided to write a tool which would automatically analyse my feed. Another thing that people sometime comment upon is whether Twitter is a broadcast service or a conversational service. So I also looked at what percentage of my tweets were replies to other people (8.7%). However, almost half of my tweets (42.8%) are accounted for by retweets of content originally Tweeted by someone else. An academic once told me that my social networking style was "to collect interesting information and share it with my friends". However, a more honest explanation would be that I am lazy and it is much easier to click on a "retweet" button than to think up original content to Tweet about. My colleague Andy Stanford-Clark was recently featured on a list of Tech Execs that smart people follow and so I decided to compare his activity to mine. More than half of his tweets (67.5%) were replies to other people and retweets accounted for only 10.8% of his tweets. Therefore it is clear that he uses Twitter as a conversational service more than I do. He also used a much smaller set of tools to interact with Twitter. He only used 8 different tools (as compared to my 18) and over half of all of his updates (65.4%) were done directly on the Twitter web site. It is also interesting that Andy is a much more prolific user of Twitter than me. I had to go back as far as 23/Nov last year (about 6 months) to get 1,000 tweets from my feed, while I only needed to 10/April this year (slightly over a month) to get 1,000 tweets from Andy's feed. It would be interesting to a similar analysis on a wider sample of Twitter users, because I guess there is no such thing as a typical Twitter user. I signed up for my first triathlon last year to mark my half century. It went so well that I was confident to sign up for TriAthy this year. I didn't worry too much about my preparation, because the race wasn't until June. However, it just dawned on me that it is now only 2 weeks to the event and so the time is running out to ensure I am prepared. I did my first open water swim of the year today in Blackrock. I am inspired to increase my dedication to keeping fit after reading the inspiring autobiography of Gerard Hartmann's the renowned physical therapist. 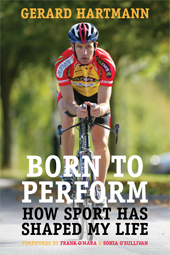 I new that he had been an athlete in his younger days, but I hadn't realized that he dominated the early days of the Triathlon sport in Ireland before his career was tragically cut short by a serious cycling accident. I feel I am fairly well prepared for the cycling, because I am training for the Wicklow 200/100, but I think I still need more training for the swimming and running legs. Here is the first draft of the slides for my proposed talk at 3D camp in Limerick the weekend after next. Feedback and comments are welcome. I am a big Linux fan, but sometimes my work requires me to work on Windows based machines. To do this I use the Remmina application to allow me to connect my laptop's screen, keyboard and mouse to the remote machine. 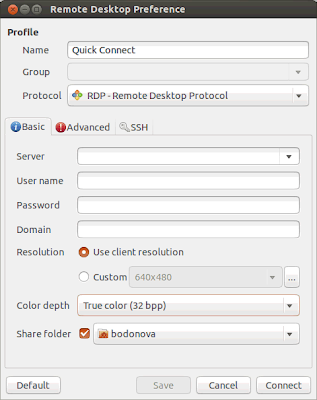 The main function of Remmina is to facilitate remote interaction through the VNC protocol for Linux servers and the RDP protocol for Windows servers However another thing that many people struggle with is the need to share files between the local machine and the remote server. This is possible, but can be tricky to set up. For this reason the Remmina dialog for setting up a new connection includes a simple check-box which allows you to specify that you want to share one of your local directories with the remote machine. When you make this selection Remmina will automatically configure a SMB share for the directory for the directory that you selected. Then it connects to the share on the target machine so you will see a shared drive listed in Windows Explorer on your target Windows machine (see the example screenshot). I am not aware of any tools for file sharing in the opposite direction (i.e. sharing files between a Windows Laptop and a Linux server). However, I would be very surprised if there were not several tools available to meet this need. Maybe one of the readers of this blog could post a comment with a link to such a tool. 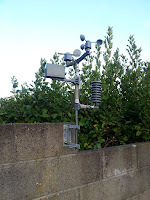 I am quite proud of my personal weather station and the fact that it automatically makes reports available through a dedicated page on the Weather Underground site. However, until recently I was embarrassed to admit that the weather station didn't have its own twitter feed. Yesterday, I rectified this situation and I can now boast to my fellow geeks that the station is Tweeting hourly weather reports as @LLweather which is a new Twitter account I created for the weather station. 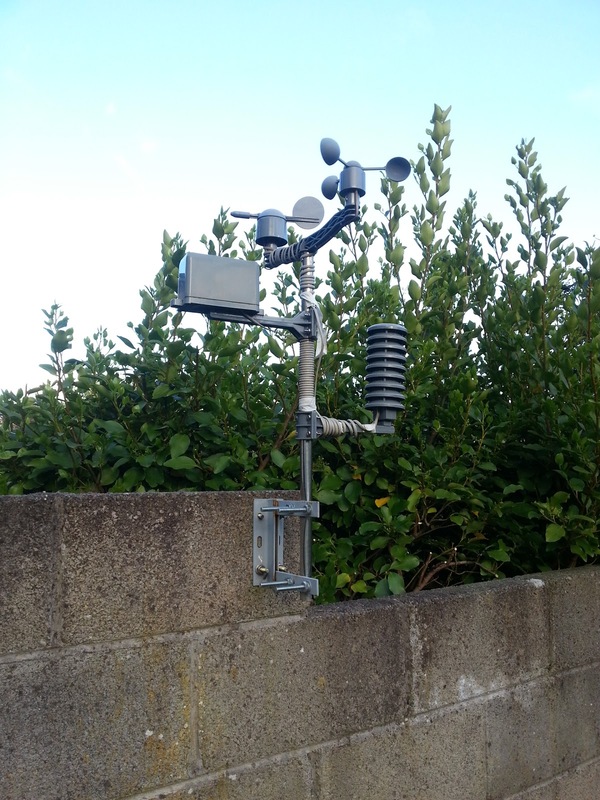 In fact it is one of a large network of private weather stations in Ireland tweeting weather reports with the #iwn hashtag - this should not be surprising because most Irish people are obsessed by weather. Initially I tried to write a short python script to do the updates, but then I discovered that this feature was already supported by the PYWWS package that I was using to upload the data to Weather underground. There were even clear instructions available on how to configure the software on their web site (I had to upgrade to v12.10 to get it to work). After I set it up I was surprised to notice that the weather station was apparently giving weather reports about 20-25 minutes into the future. When I investigated I found that the clock on my Tonido plug was running alarmingly fast. I tried to set up the NTP deamon to keep the clock synchronised, but this proved complicated because the plug is running a very old version of Ubuntu. I corrected the time manually and will keep an eye on it until I get around to configuring NTP properly. 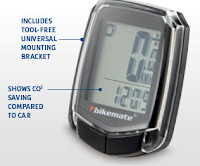 I like cycling and I like gadgets so I suppose it is not surprising that I consider that it is essential to have some form of bike computer to keep track of my speed and distance. Currently I am using simple bike computers on each of my bikes which I bought for €5.99 in Aldi. 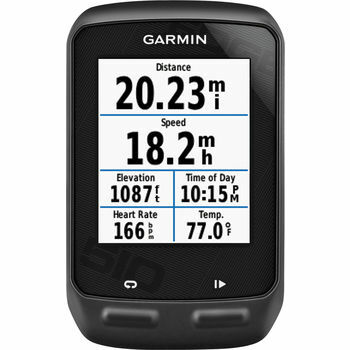 It has built in GPS so as well as tracking my speed it can also record exactly where I was cycling. It allows uploading of data directly to the internet so I can analyse my performance with neat visualization tools. It connects with additional sensors to track things like my hear rate and cadence so I can judge how effective my training is. However, these features come at a price. 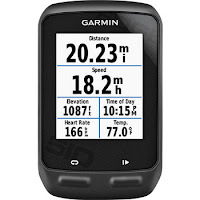 The Garmin model costs about €250 as compared to only €6 for the Adli model. Therefore I think I will stick with my Aldi computer for the moment. In any case I can use some neat free apps for my phone to track my training in addition to the bike computer. Like many other people I was surprised to hear about Google cancelling two of my favourite tools - the Google Reader service for managing your RSS feeds and the Google Listen podcast player. Apparently the reason given is that they could not see any way to make revenue from these products, but I would have though that the users of Google Reader would have been a gold mine of data in relation to what feeds are most popular through the number of reads/favourites/shares etc.. I like the simplicity of Google Listen and you can still install Google Listen, but only if you have saved a link to it (it no longer shows up in search results). I occasionally find that Listen will crash at random times and since Google have cancelled the project they are unlikely to fix it (I wonder why they didn’t Open Source the project like they did with Google Wave), As a result I have switched to BeyondPod as a replacement. Overall I find it reasonably easy to use - I have paid for the Pro version, but I don't think I really use any of the Pro features so the free version is equally good from my point of view. Apparently Google Reader site will be shutting down in July, so while there is no mad rush to get off the platform, it is still a good idea to find some other tool to replace it. The consensus on the internet seems to be that Feedly is the best alternative - my initial experiences seem to back up that claim.